Thin Titanium Radiation Shield Enclosures (TTRSE) provide an innovative replacement for Multi-Layer Insulation (MLI) blankets improving the thermal isolation of instruments to their local environments. This solution yields a lower volume product with a potentially lower mass while also eliminating sources of contamination, Foreign Object Debris (FOD) and water entrapment. This innovation replaces the labor intensive and non-uniform current blanket of MLI insulation with an analyzable, predictable and repeatable replacement. Peregrine designed, analyzed, tested and demonstrated the potential of TTRSE. A four layer TTRSE enclosure was deemed feasible to replace a 25 to 30-layer MLI blanket and provide an effective emissivity of .02 and a thermal conductivity that was much lower than .005 W/mºK. The other advantage that this technology provides is that it can be modeled and analyzed and it can be pre-qualified prior to assembly. This is very significant in that a known entity can be assembled into an instrument to provide the insulation required to meet demanding space environments. Currently, insulation is done in situ and relies upon factors such as accessibility, volume, a skilled technician and flexibility in the application of multi-layer insulation blankets. Typically all of those factors are seldom present when required. TTRSE eliminates this uncertainty, which equates to substantial savings in regards to schedule, testing facilities and labor. The advantage that a multi-layer titanium insulation blanket provides is that it is modelable, predictable and consistent from build to build. There is no custom tailoring or errors introduced by the lay-up techniques or technician variations currently introduced from a multi-layer buildup like MLI. One of the key advantages of our TTRSE is that it can be modeled and analyzed independently from the other components within the instrument. This means that there are no surprises in thermal vacuum testing and qualification of the end instrument. It provides a consistent and repeatable product. 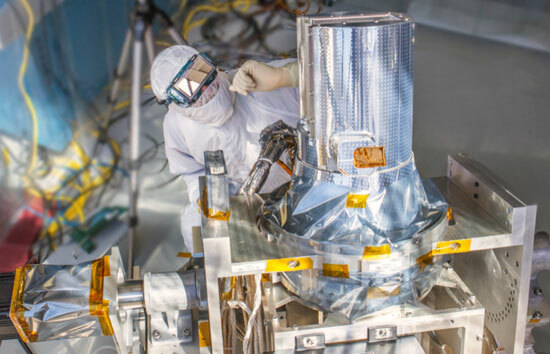 In addition, the multi-layer assembly could be removed readily and replaced readily during the integration phase of the instrument so as to make adjustments to the instrument it insulates if testing necessitates. Because the materials used are all titanium, there is no water absorption, no contamination and no FOD that could be introduced into the system. Again; because it is a metal; it can be baked out at elevated temperatures which secures a clean and contamination free environment. The design incorporates perforations allowing for quick evacuation times. TTRSEs are made from multiple thin layers of titanium or aluminum with a small gap between each layer which allows for a vacuum barrier to be created when the assembly is laced into orbit. A TTRSE of 0.100” in cross sectional thickness can replace an MLI of 1” thick. Currently, instruments are integrated and then multi-layer insulation is added. The blanket is laid up and attached at stand offs and insulation locations but in essence it is a flexible blanket that can come into contact with various components onboard the instrument. This leads to unpredictability of the performance of the insulation. Therefore more insulation is utilized in order to produce more isolation from the local environment. Typically 30 layers of MLI are common and therefore can lead to a significant volume build up over the instrument. Because of the amount of layers required, a large surface area existed with the potential of contamination and water absorption. It takes significant time to evacuate an instrument with multi-layer insulation in place. This leads to long cycle times and also the frustrations of making adjustments to the instrument based upon its performance under vacuum. If there are numerous test issues associated with the instrument, the multi-layer insulation will require removal layer by layer and then need to be replaced. Each lay-up can affect overall thermal performance. In addition, the edges of all the multi-layer insulation needed to be sealed and protected along with an area to vent the multi-layer insulation so that air, moisture, and any other out gassing materials can be removed from the blankets. MLI material is potentially friable and with the potential of FOD this provides significant risk. In addition, since MLI blankets are flexible, bulky and volume is constrained around most instruments, technicians typically force the layers of a blanket into position leading to thermal shunts. TTRSE provides a high fidelity solution. 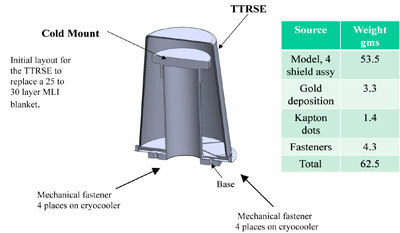 Figure 2: Cross section of TTRSE mounted over a Cryo-cooler cold mount. Our original objective was to replace a 25 to 30 layer MLI blanket by achieving an equivalent effective emissivity (0.02) and an effective thermal conductivity (0.005) while eliminating sources of contamination, pump down times, labor and overall costs associated with MLI insulation. We began this effort by analyzing the number of layers required to achieve a .02 effective emittance. This study was performed using SINDA/3D software and calculations were run for 2 layers through 8 layers and the data graphed as the effective emissivity achieved for the different number of layers. The parameters used in calculations were a thickness of the layers of .006” each, with a .005” gap in between each layer. We used an emissivity number of .04 to .07 for the surface of both sides of each layer. This is based on the emittance achieved through use of gold vapor deposition onto the shield material. The ambient temperature on the exterior surfaces was fixed at 300º K and the interior surface was fixed at 70º K assuming a cold mount temperature of 40º K. Analyses were run and the effective emissivity for four layers was all that was necessary to achieve the goals for both e* and k.